Hello Steve. Let me tell you what my MSE setup is. 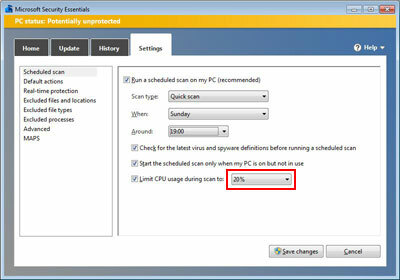 First of all I limit the CPU usage during scan to 20% rather than 50%. This is because I use large Microsoft Excel files and they take quite a bit of CPU power to load and update. I don't want Microsoft Security Essentials taking up too much CPU when it is performing background scans. I agree with your assertion that Severe and High Alert Levels should be set to remove. If a virus of this nature is detected on your computer then you need it removed. Fast! I also have real-time protection turned on. I have also not used Excluded Files and Locations. 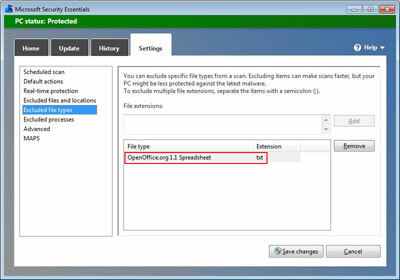 However, I have used Excluded File Types to stop scanning files that cannot hold the payload of a virus. For example, I do exclude text files (*.txt) as I have many and I am confident they are safe. In Advanced option I have all options ticked except Scan Removable Files. I don't use USB Pens or external Hard Drives on this computer. In answer to your last statement I don't think there are any specific right or wrong answers here. Disabling some options is foolish however some are a matter of circumstances and what your requirements are. Thank you for creating your web site. It has been a pleasure to browse and I will be back to see how things develop. Hello Alan. Thank you for your contribution. I think your approach to setting up Microsoft Security Essentials is sensible. You have made amendments that suit your circumstances, such as reducing CPU usage. I agree with your decision to exclude text files to improve scanning efficiency. However, it is worth mentioning that some viruses can be disguised as a text file. They usually look like *.txt.exe. But judging by your page I am certain you already knew this! If these type of files are not scanned, they will cause damage to your computer or data. True text files can't execute virus payloads. Join in and write your own page! It's easy to do. How? Simply click here to return to Microsoft Virus Protection.